Cook up a storm with casserole dishes and cookware that make a statement in the kitchen and in dining room. When your guests see the steaming hot Le Creuset casserole dishes you bring out to them, the food will become only a happy afterthought. ShopCookware stocks the finest selection of Le Creuset products available on the internet and at a cost that you will have to see to believe. Browse below and discover the wide range of preparation dishes. 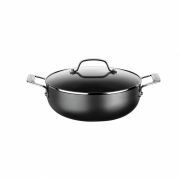 Shopcookware also stock and sell great value casserole dishes from other suppliers such as Denby, La Cusine, Prestige, Pyrex and Stellar to name but a few. Le Creuset produces extremely attractive pots and pans, but it is the casserole dishes that you have ventured into this section to find. These dishes are sturdy, as they have been hand-fired at over 800 degrees. They also include a distinctive colouring that signifies the trademark of the Le Creuset brand. Our casserole dishes come in a variety of sizes, ranging from 22 centimetres and climbing to an impressive 31” for the very largest of these pots, which are capable of holding a full roast, turkey or larger meal with no issue at all. Casserole means "one dish meal" and as such it has become one of the most popular forms of cooking in the world. Any meat can be cooked to a delicious and succulent meal in a casserole dish, just by adding a few vegetables, some sauce and perhaps some cheese to top off the dish. Once your hearty dish has been prepared, it can then be frozen and kept for up to three months, to be enjoyed time and time again. One of the best features of a casserole dish (and indeed, our casserole dishes) is that they can be oven baked at up to 350 degrees to seal in the goodness, much like a clay oven. Use your imagination and you will be able to create a jovial meal that is fully capable of feeding a large family. Casserole dishes bring out the chef in anyone and enable the whole family to get together and throw their favourite ingredients into the pot. Select the Le Creuset cast iron cookware that you wish to use from our options above and start cooking up a storm! Don't fall for the trap of believing that Casserole pots and casserole cookware can only be used to make casseroles which is why they are often only considered to be purchased and used in the colder months of the year. Cast Iron Casseroles are versatile cookware dishes and are excellent for slow cooking meats, stews and other recipes in both the oven or on a very low direct heat. Cast iron casseroles are induction ready and therefore can be used on Induction hobs. They also make great curries, and, if you purchase the larger sizes you will find them great when catering for a large number of people. Don't waste time plating out dishes of food, simply bring the casserole dish direct to the table and serve in situ. As cast iron retains heat for much longer food stays warmer in it and it also makes serving second helpings easier.